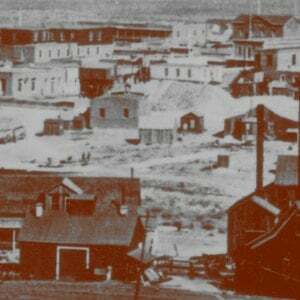 Tombstone, the epicenter of the Wild West in 1882, boasted sixty saloons, ten faro games and, one among many, the most famous brothel between Basin Street and the Barbary Coast. All manner of sin was legal, and as such, taxed: here gamblers rented space from saloon owners and faro “bankers” were licensed by the municipal authorities. This license, signed by Sheriff Johnny Behan, gave the famous gambler Ike Isaacs the right to run his faro game for one month, at a cost of $25.00 – about $525.00 in today’s money. Document Signed (by Treasurer Dunbar, Sheriff Behan and Deputy Harley), partially-printed and accomplished in manuscript, being a receipt issued to Ike Isaacs for a license to gamble in Cashise Country; 1 page, duodecimo, Cashise County [now Cochise County, Arizona], January 1, 1882. LICENSE TAX RECEIPT FOR CASHISE COUNTY.